Simonds Farsons Cisk plc held its annual presentation for financial analysts last Friday. The presentation was lengthier than usual since it not only included the customary in-depth information on the performance of the past financial year but there were two other presentations on the Group’s upcoming plans for its sizeable property interests. The development of the large parcel of land in Mriehel and the spin-off of the non-core properties into a separate publicly traded vehicle had first been mentioned by Farsons way back in 2008. After several years of slow progress as the company gradually relocated all manufacturing facilities and administration offices to the back end of the Mriehel site and carefully studied the best use of this sizeable tract of land, a Company Announcement was issued last Friday informing the market that two applications were submitted to the Malta Environment and Planning Authority (MEPA) in connection with the development of the ‘Farsons Business Park’. Chairman Mr Louis Farrugia gave a brief overview of the Farsons Business Park and the mechanics of the property spin-off while the British architect Prof Ian Ritchie, who is entrusted with the project with the support of Maltese engineers and other consultants, delivered a detailed presentation showing the transformation of the site with the specific attention given to the iconic old brewhouse and the façade. The old brewhouse which will be retained by Simonds Farsons Cisk plc and will therefore not be spun-off into the property holding company will be restored and converted into a visitor centre including a beer academy, retail and catering facilities and the construction on the roof of a ‘CISK Sky Bar’. The Farsons Business Park will comprise seven office blocks limited to five storeys each. Prof Ian Ritchie provided detailed images of how these will be constructed behind the historic façade and the courtyards that will separate each building from one another. 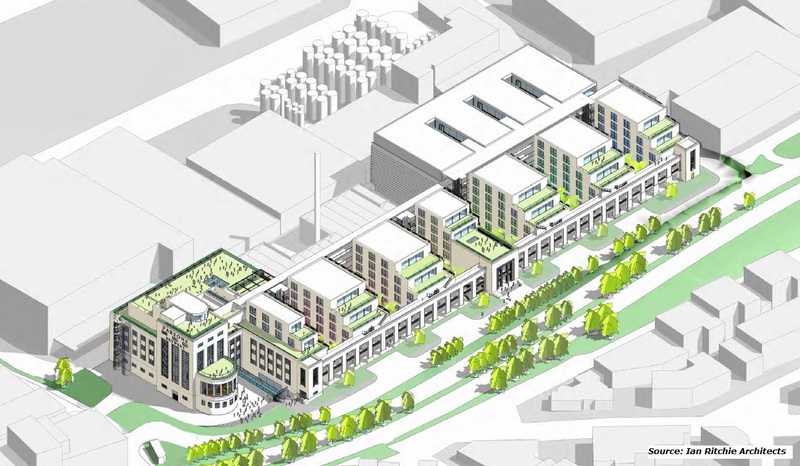 A multi-storey car park will also be constructed and will be connected to each of the seven buildings and the old brewhouse through restored corridors and walkways. Works on the Farsons Business Park are expected to commence towards the middle of next year and will be developed in a phased manner. Mr Farrugia explained that by March 2018, Farsons aims to complete the conversion of the old brewhouse and the first office block. Three other office blocks will be constructed by October 2018 followed by the car park and overlying offices in January 2019. The last phase incorporating the final three office blocks is aimed to be completed by January 2020. On completion, the Farsons Business Park will comprise over 18,000 square metres of office space, more than 1,200 square metres of food and beverage facilities and a car park of over 700 spaces. The upcoming development however does not include the area currently housing the ‘Farsonsdirect.com’ retail premises and the other large tract of land besides the property also along the main road. This could possibly take place at a later stage once the Farsons Business Park is completed and fully operational. During the meeting Mr Farrugia also provided initial details on the planned spin-off of the property assets into a separate public company which will also be quoted on the Malta Stock Exchange. The aim is to hive off those properties that are not directly related to the core food and beverage business. These comprise the Mriehel façade, ‘Trident House’ in Marsa currently being occupied by the fully-owned subsidiary Quintano Foods Ltd, the properties housing the franchised food businesses (namely Pizza Hut, Burger King and KFL) as well as some other properties currently also being leased out to third parties. The segregation of the Farsons Group into two distinct publicly traded companies will also enable individual shareholders to decide whether to remain invested in both sectors or whether to focus specifically on one distinct area. Mr Farrugia also mentioned the possibility of attracting new strategic partners and shareholders to the property side of the business – either as an investor in the new property development company or specifically in a particular development. This could be necessary if Trident House and the adjacent parcel of land is developed into a high-rise commercial development as had been indicated many years ago before the decision was taken to utilize the property for Quintano Foods. The Chairman indicated that the spin-off will take place via a dividend to the shareholders of Simonds Farsons Cisk plc at the time of the corporate action. The dividend however will not be a cash dividend but one in specie, i.e. a distribution of shares in the property company equivalent to the same shareholding level as that previously held via Simonds Farsons Cisk plc. Mr Farrugia highlighted that the spin-off will take place during the first six months of 2017 and the over-riding objective of the restructuring exercise is to maximise shareholder value and ensure the best use of the large property portfolio. During his presentation, the Chairman also referred to the funding requirements of the upcoming investment programme. The total investment of the Farsons Business Park is estimated at €42 million and Mr Farrugia explained that the various options being considered are a rights issue as well as debt funding via a bond issue or otherwise via bank borrowings. In reply to questions from the floor, Mr Farrugia also announced that discussions are currently underway with the three dominant shareholders (Farrugia Investments Limited, MSM Investments Limited and Sciclunas Estates Limited who together hold just under 80% of the issued share capital of Simonds Farsons Cisk plc) on the rights issue and he expects a positive attitude towards additional investment by these family-owned companies. The Company Announcement issued last Friday also indicated that the Farsons’ Board of Directors is additionally looking at funding options for the traditional food and beverage business. The major investment in this area is the new beer packaging facility at a cost of €27 million which is due to be completed in April 2016. During the meeting, the Chairman also mentioned an investment in additional office space overlying the current administration centre and in his statement to shareholders in the Annual Report, Mr Farrugia made reference to the fact that the company’s management is considering other investments in the operations and distribution areas in order to ensure that the company can achieve its vision of truly becoming a regional player within the food and beverage sector. One of these is the extension of the logistics centre to create additional storage following the increase in production capabilities and the ultimate objective of significantly enhancing the export side of the business with the intention of generating up to 30% of overall revenue from exports. The confirmation of Farsons’ intention to hive off the property assets is an important milestone not only for the Group but also for the local financial market. Although this may not necessarily imply a new fund raising exercise at the outset for all investors (new shares will only be allotted to shareholders of Farsons) by this newly quoted company, given the substantial availability of investible funds at both retail and institutional investors, every effort needs to be made by market participants, the Malta Stock Exchange, the MFSA and also Government officials to seek ways of growing the number of listed securities to ensure that investors have a wider choice where to invest their idle funds. These options must not only be focused on the bond market but also the equity market as a larger number of retail investors are now also inclined to consider investing in shares. The hiving off of the Farsons property company is however still two years away and this could be preceded with a similar exercise by GO plc as they intimated in the press recently. Failure to create new equity and bond investments could result in ‘bubbles’ forming in these asset classes as well as in the property market. Another scenario would be capital flight with investors seeking overseas investments as an alternative to investing in their own country.